The situation at Google Base seems to be changing. There is now a login page up on the Google Base site. I type my gmail user name and password into it but the result is that I keep getting cycled back to the j login page. So, either its a facade they have put up to look better than that nasty 500 error they were showing yesterday or they are screening who can get through. I guess we'll have to keep waiting. The service must be getting crushed. I still can't bring up the site. I don't remember this happening with other Google service launches. 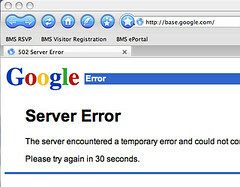 Google Base is different. It's looks like it may be the first application level service aimed at developers rather than the Google version of an existing web site/service. I just got a invite to start a WordPress blog. I've been thinking about ditching Blogger for a while because they are pretty slow to add new features. Trackback is the one I'm most eager to get up and running. We'll see. Update: BTW the invite was extended by downloading Flock. Wow. Flock is really impressive.? Yes, I know I'm a bit late in the game to take a look at this facinating browser, but I think it's worth discussing at length. First off, for the uninformed, Flock is a browser based on Firefox. As such it has all the good ness of this rising force in the browser world. It's safe, fast, extensible, and the latter makes it a hot bed for browser innovation.? There are few browsers already based on Firefox and it's Gecko rendering engine. Some offer tighter integration with one OS or another like Camino for Mac OS X.? But Flock goes beyond OS integation and build into the browser a few simple tools directly into the browser that make the web, specifically blogs (insert your blogging platform of choice here), photo sharing (flickr), and link sharing (del.icio.us) into a single program. The combination is powerful.? Replacing static bookmarks on your computer with a network social bookmarking service (del.icio.us) brings a whole new set of functionality to your bookmarks.? Since they are saved on the network they are available from any system.? But del.icio.us allows you to tag your bookmarks with keywords and Flock allows you to view your bookmarks by tag. Adding bookmarks with Flock is simple and Flock exposes the tagging feature of del.icio.us to the user.? One feature Flock should add is del.icio.us' ability to see other users' bookmarks, how they've tagged them, and other users' bookmarks tagged with your tags.? e.g. Say you bookmark a link from the NY Times on the Iraq War and tag it with the word 'iraq', del.icio.us will let you click on the link and see all other bookmarks saved by other users that have been tagged with the work 'iraq'.? Kind of interesting, eh?? This might lead you to new information that other people with similar tastes or interests are aware of but you have missed.? I'm sure this feaure will be exposed in the future. Flock has RSS reading features similar to Firefox and Safari.? Point the browser to a web page that has an RSS feed an you'll see a "Feed" icon in the address bar.? Click on the "Feed" icon and you'll see the RSS content rendered in the browser window.? Bookmark the site and you'll be able to jump back to the RSS Feed simply by clicking on the bookmark.? Flock will automatically act as a blog reader by allowing you to view all the RSS feeds you've bookmarked in one aggregated view. It's hard to describe but download the browser and give it a try. The downside of this automatic blog aggregation is there isn't a good way to import subscriptions other than bookmarking all of the sites your reading and then clicking on the "Feed" icon in the browser.? If there was a way to import OPML into Flock that might make things easier. The browser also has built in blogging tools. Sure there are other blogging interfaces to browsers but Flock has added a tool called the Shelf which allows you to drag items (text, pictures, URLs) off web pages into this temporary store then when you want to blog about them you can drag them off the shelf and drop them into the blog posting tool.? Very cool.? The blogging tool could use a few upgrades like spell check, etc. but I bet most of them could be added by using Firefox extensions. But wait there is more.? Flock also integrates into photo sharing, right now only with Flickr.? Your photos are available via the blogging tool for easy insertion into posts. Stability is lacking in this browser but I'm sure that will improve over time.? That might be the one thing that would keep me from making Flock my standard browser. There has been a lot of noise that Flock is the Web 2.0 browser.? I don't buy that kind of hype.? The Flock team has put together is a browser that reflects the current state of the web. A web where HTML is still important but where RSS, OPML, dare I say the semantic web, is increasingly becoming more important. I'll be watching this project very closely. Sun to Dell Customers, "Why are you buying crappy Dell boxes?" Do you think the real reason the WSJ won't carry this ad is not that it's outlandish but because it's true? Bravo Jonathan. Let's see if your ability to realize the nets lack of an editorial policy converts to some Dell customers buying a few slick Opteron boxes from Sun. The only question I have for Mr. Schwartz is why didn't you just run the ad on your front page? Last Thursday was another great show by the Moroccan Sheepherders who opened for Vince Welnick at the Ace of Clubs in New York City. The faithful fan base packed in the venue to listen to a one and a half hour set of classic and new songs interleaved into an melange of pure aural bliss. While the "flock" was out in full force there were a number of new faces who turned out to listen to this innovative band. The Sheepherders opened up the show with a new song "Going Down", a solid up tempo rock tune. It was the most traditional song of the evening but an incredible new addition to the repertoire. "Cabin in the Dark" another new tune evoked native american animal totems over rich funk/folk beats and melody. The band blew the crowd away by capping the set with two tributes to the Grateful Dead and tip of the hat to Mr. Welnick. "Warf Rat" and "The Other One" got the crowd on their feet. While both covers were executed with elan, "The Other One" stands out as a song that really matches the bands talents and temperament. (I'm personally lobbying the band to cover "Eleven". Come to think of it I'd like to hear the Sheepherders' take on Yes' "South Side of the Sky" but I digress.) The extended show was the coming out party for two of the bands new members Andrea Watts (vocals) and Sheila Early (percussion). Watts' soulful and powerful voice was in perfect form as she added her own embellishments to Sheepherder favorites like "On the Vine" and "Coming For You". The former suggested by yours truly, but later being the most intriguing addition of Watts' unique spice. Early, the band's own "Sheila E", lived up to and surpassed her namesake as she furiously hammered out staccato beat accents on the timbales that enhanced the already well endowed percussion section. Her frenetic presence was felt as the band moved into an extended percussion jam at the tail end of "Moroccan Roll". The show marks a new highlight in the bands evolution. New members, a growing fan-base, and a new tunes to get the crowd moving are all great accomplishments. A new CD would round out the season and while it has not been announced is eagerly being anticipated by the "flock". I urge music fans to get out to the next show and listen to this unique group work their own blend of ambient tribal blues rock. Google Reader is a big disappointment. While the interface reaches a new level of interactivity and snappiness with it's extensive use of AJAX techniques, it suffers from serious usability issues. The major problem I have with this Web 2.0 app is that it actually slows down my blog reading. When you are looking at a particular feed you only see headlines on the left and the current item on the right. You have to page down each item to get the summary text for each item. Granted you get a nice animated scroll effect as each item moves by and you get keyboard shortcuts to scroll down each item but it's painfully slow to read blogs this way. Bloglines shows you the title and the summary text on one page so you can quickly skim each item in the feed. This is much faster and more efficient for those of us with many subscriptions. Sorry Google. Go back to the drawing board on this one. Big disappointment.